The leader of the Indigenous People of Biafra (IPOB) Nnamdi Kanu, has come out of hiding nine months after the military invasion of his community in Abia State, southeast Nigeria. Uche Mefor, the Deputy leader of the separatist group, made the announcement in a post on social media network, Facebook on Friday afternoon. 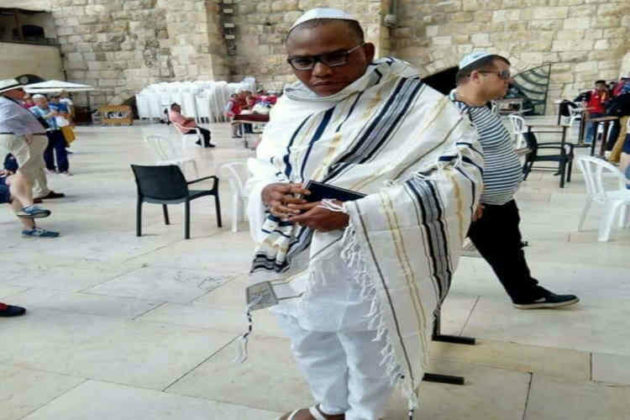 According to Mefor’s post, the IPOB leader, who went into hiding after the Nigerian military clashed with members of his group last year, was spotted praying in Jerusalem, Isreal. The IPOB Deputy leader wrote: “Fellow Biafrans, friends of Biafra, men and women of goodwill and of good conscience, warm greetings to all. 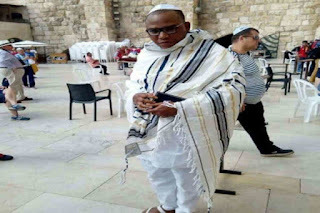 “We wish to reliably inform you that The Supreme Leader of the Indigenous People of Biafra, Mazi Nnamdi Kanu would within an hour from now praying in Jerusalem Live on Facebook. “All are enjoined to hook on. Chukwu Okike is in charge“, Mefor wrote on Facebook. This development is coming a week after Governor Okezie Ikpeazu of Abia state assured the people of Afaraukwu Ibeku Autonomous community (Nnamdi Kanu’s community) that their traditional ruler, Eze Israel Kanu (the father of Nnamdi Kanu) is alive and well and will return home soon. The Abia State Governor had said that the South East Governors were working round the clock to ensure the return of the monarch who has not been seen since the military invasion of his community in 2017. Governor Ikpeazu had said: “The southeast Governors as a body is doing its best to ensure that Eze Kanu is reunited with his community. Your traditional rulers will go with me to meet other south-east governors and we will work to ensure that Eze Kanu does not spend the new year outside his domain,” the Abia state governor added. Meanwhile, it is, however, unclear how Kanu got to Isreal since the IPOB had raised an alarm that the passports (British and Nigerian) of its leader had been seized by the Nigerian government.